Yoshiro Mori, president of the Tokyo Organizing Committee of the Olympic and Paralympic Games, told the media in Tokyo on Dec. 14 that he preferred the second of two possible Olympic stadium proposals that were announced by the committee the same day. Mori began by saying, "To us what is more important than the outward design is the contents. What's more important than which is better (appearance-wise) is what is inside." However, when asked for his opinion on the outward appearance of the designs, Mori said, "Looking just at the outside, 'Proposal B' is better. It has a very sports-like atmosphere. It's like a Greek temple," while saying of 'Proposal A,' "It doesn't have the bright feeling of a major event (like the Olympics)." 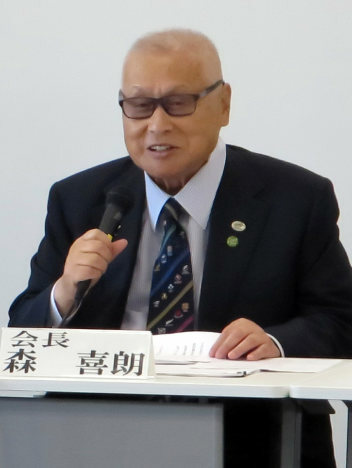 Mori was criticized previously for language unbecoming the head of the Olympic committee for saying the earlier, scrapped plan for the stadium with its characteristic "keel arches" looked like a "raw oyster." His expression of support for one of the two released proposals over the other before an official decision on which to use has been reached could invite similar criticism that he is acting prematurely. The proposals for the new stadium, which is to be built in Tokyo's Shinjuku Ward, come over three years after the previous, scrapped plan was announced. The new designs were revealed over the Internet at about 2 p.m. on Dec. 14 by the Japan Sport Council, but the event was plagued by heavy Internet traffic. It is claimed that the construction for both proposals would be completed in November 2019, ahead of the January 2020 date sought by the International Olympic Committee. The schedule will not be in time for the Japan 2019 Rugby World Cup, and Mori, who is honorary chairman of the Japan Rugby Football Union, said, "If they would only finish the stadium two months earlier, we could use it for rugby." Tsuyoshi Hirao, a former player on Japan's national rugby team and a lecturer at Kobe Shinwa Women's University, said, "I want the stadiums (to be designed) to put the athletes first." He was complimentary of the new stadium proposals, saying, "They have their construction budgets kept down to about the same level, and while the costs for the previous stadium design ballooned, this time they are being worked on properly." Yuko Arimori, an Olympic marathon medalist, said, "They are simple, and share a similar feeling. More important than their appearance is their functionality and ease of use." Meanwhile, on Dec. 15, Minister of Education, Culture, Sports, Science and Technology Hiroshi Hase spoke to reporters at a press conference after a Cabinet meeting. When a reporter asked Hase what he thought about the two stadium plans, Hase asked back, "Did Mori really say that 'Proposal B' is better?" He also commented, "I wonder if it's okay to say such a thing." Regarding his own opinion, Hase said, "Both proposals are good. Speaking from my position, I want the stadium to be in harmony with its environment. I want a final decision on which plan to use to be made after national debate on the issue." Of the two plans, Proposal A would mainly be handled by Taisei Corp., while Proposal B would be handled by contractors including Takenaka Corp.